A number of accidentally and intentionally released aquatic species can be found in the Columbia River Basin. CRITFC’s Aquatic Invasive Species Coordinator Blaine Parker monitors the system for these species that can impact the health of the water systems and the native aquatic species that live there. Below are a few of these invasive animals to be on the lookout for. Native to eastern Asia, introduced into United States in the early 1960’s as a potential aquaculture fish. Fish escaped or were released in a number of locations. Present in the Columbia River, likely from Washington pond fish that escaped in the floods of the mid-1990’s. Several large adult fish were captured by tribal fishers in 2012. Grass carp are large fish, commonly exceeding 40 pounds. They feed heavily on aquatic vegetation and can dramatically alter native habitats if left uncontrolled. A salmon native to eastern North America and Europe, wild stocks in decline and greatly reduced from historical abundances. Widely used as a fish in ocean net pen aquaculture from British Columbia to Chile. Commonly used in Puget Sound net pet aquaculture, escaping in large numbers at times. Alaska and Washington are very concerned about escaped fish colonizing coastal streams and out competing native Pacific salmon stocks. Found irregularly in the Columbia River, although maybe present in greater numbers, due to lack of reporting. Large predatory fish native to the eastern and northern parts of North America, but widely distributed due to stocking by fishery managers for sport fishing purposes. However, in many cases, this movement outside their native range has greatly impact local species. They are voracious predators and often catch and consume fish nearly half their body length. Currently found in a number of locations that drain into the Columbia River, in the states of Idaho, Montana, Washington and British Columbia. These introductions were mainly illegal, done by sport fishers, also known as “bucket biologists.” In addition to eating a wide variety of fishes, northern pike can and do eat waterfowl, small mammals and a wide assortment of amphibians and reptiles. These long-lived fish can reach over 40 pounds in weight. This predatory fish is both a natural and artificial hybrid of northern pike and muskellunge. Its natural range would be in overlapping areas of the two parent species, commonly in the Great Lakes region of southern Canada and eastern United States. The artificial hybrid has been stocked into a number of states across the United States. It has been stocked and maintained through stocking in Washington for a number of years in lakes and reservoirs on both sides of the Cascades. Like the donor species, the hybrid tiger muskie is a large voracious predator of all things in its environment, including a wide variety of fishes, reptiles and amphibians and occasionally birds and mammals. 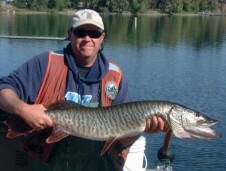 Unlike the northern pike, it represents less of a threat to native fish communities, although tiger muskies can breed successfully with northern pike and produce viable offspring. It can exceed 30 pounds in weight, with the Washington state record at 31.25 lbs. Given the importance of collecting physical evidence for analysis, CRITFC will pay fishers for any invasive or undocumented fish species caught by Indian fishers in Zone 6. If you catch one, keep it fresh on ice, but do not freeze it as freezing can damage soft tissue that is used to identify the species and determine the fish's characteristics. If you catch one of the species listed above, contact CRITFC’s Aquatic Invasive Species Coordinator Blaine Parker at 503-731-1268 or via email at parb@critfc.org.